Oh no, I hear you muttering, no another match the hatch book, surely we have had enough of those already? Well yes, too right, says I, but you have never seen anything quite like this one, which in a jacket pocket-sized space manages to get in all the common British stream side insects and illustrate them together with their nymphs and a selection of patterns to imitate them - and when I say together, I mean right next to each other. The huge advantage of this approach is that for the first time it is possible for beginners to carry a cheap book in their pocket which will let them identify an insect on the water and choose a fly to match it. I have no doubt that legions of experts are already sharpening their pencils and suggesting a different set of patterns, which is why we have ended up with tens of thousands of artificials representing a few dozen insects, but beginners need to start somewhere and Peter’s selection is as good as any I have seen. 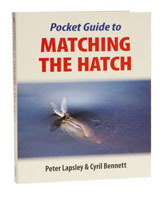 Cyril Bennett’s contribution is no less sound: the photographs of the insects are sharp and are rendered about twice real size together with a life size silhouette, a hatch chart showing which months to expect to see them and a distribution map for the UK, as well as an indication of whether they can be found in lakes or rivers. In a stroke of genius, all the artificials are available in the Fulling Mill catalogue and all common angler’s insects are covered, together with a selection of lures, spider, traditional and attractor patterns, none of which are you likely to see hatching, but all of which come in very handy for catching trout that haven’t been on the advanced entomology course. The last few pages cover the life cycles of the upwinged flies, sedges, midges and stonefly; followed by a short section on how to fish different types of rise, so there is a great deal packed in to the 96 pages. Shortcomings? None really, apart from the fact that the second edition ought to be waterproof. This book is exactly the sort of thing I needed when I started fly fishing forty years ago and it just goes to show what a lazy devil Lapsley is that he took all that time to get around to writing it. I think the authors deserve some kind of a prize.